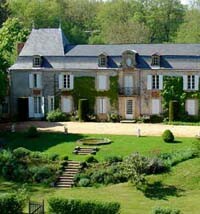 Tucked away in the small commune of Cendrieux, in the heart of the Périgord region, and housed in a modest château belonging to the Witt family, is the Musée Napoléon de la Pommerie. The property was acquired towards the end of the 1940s by Princess Marie-Clotilde Napoléon, the great grand-daughter of Jerome, King of Westphalia [see our detailed family tree], and her husband, Comte Serge de Witt; today it is their son, Comte Baudoin de Witt, who owns the château. The Musée Napoléon, which opened in 1999, holds a large number of souvenirs once belonging to the imperial family and handed down through the years. As well as the museum, the domaine de La Pommerie regularly organises cultural events, including concerts, theatrical performances, cinema screenings and talks. Over five hundred objects, paintings and sculptures make up the museum’s collection, one hundred and fifty of which are listed as “monuments historiques” (a French state procedure designed to protect and preserve aspects of French historical heritage). Some of the most important works, painted by the Napoleonic era’s greatest painters, hang in the museum, including Napoléon en Costume Impérial, by Anne-Louis Girodet, and L’Impératrice Joséphine en grand costume, by Gérard. The museum also contains everyday personal items belonging to imperial family members, including the Prince Imperial’s baptism cap and Napoleon’s snuffbox from St Helena, which features a miniature of Madame Mère, painted by Isabey. The collection also contains porcelain items, Jerome’s uniforms, furniture and bronze work. The museum has also a large collection of objects relating to Napoleonic legend, bearing symbols of the imperial regime and generally intended to ensure that memory of the imperial family continues. The museum has published a small guidebook which offers an introduction to the museum and its exceptional collection. The association’s mission is to offer moral and material support for the development and maintenance of the museum; to offer assistance, both financially and logistically, for projects of a cultural, educational, and promotional nature, as well as those relating to tourism, training and general service; to maintain and develop the museum’s profile and influence via many different means, events and exhibitions, in France and abroad. Visits (groups of four or more individuals) to the museum for the rest of the year can be organised by appointment.